The 2019 Toyota Camry LE features layered wood interior trim that adds a touch of class to the interior cabin. Featuring Sport SofTex-trimmed front seats, you'll enjoy a sumptuous and comfortable interior cabin every time you get in. The 2019 Toyota Camry XLE is powered by a 3.5-liter V6 engine that pumps out 301 horsepower for spirited acceleration that will make you smile. Drive easier with a 10-inch color Heads-up display. 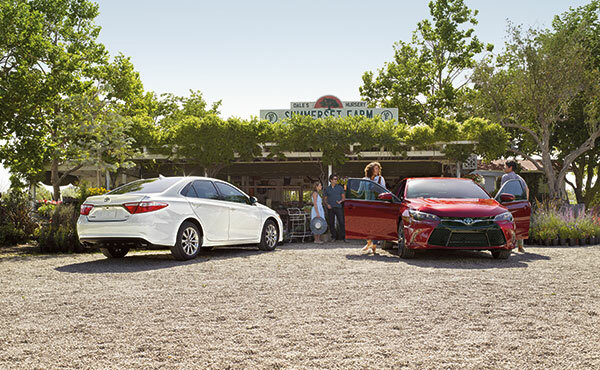 Equipped with Entune 3.0 Audio Plus with JBL, the 2019 Toyota Camry XSE comes well-equipped with features you'll enjoy. Impossible to ignore. The 2017 Toyota Camry. Let's make everyone do a double take. The 2017 Toyota Camry is here to turn heads, and its sculpted body lines, aggressive grille and muscular fenders are sure to command attention. vailable LED Daytime Running Lights (DRL) shine bright and add to Camry's premium feel; out back, the unique taillight treatment and available dual exhaust give a not-so-subtle hint at the power that lies under the hood. Add in Camry's athletic stance and available 18-in. alloy wheels,1 and you've got yourself a sporty sedan that makes everyone take notice. Your driving thrills start here. Let's go places.